In this study, we investigate nematic-isotropic phase transitions in liquid crystals using fractionally generalized form of the Maier-Saupe Theory (MST). MST is one of the mean-field theories commonly used in the nematic liquid crystals which proved to be extremely useful in explaining nematic-isotropic phase transitions. Fractionally obtained results compared with those of the experimental data for p-azoxyanisole (PAA) in the literature. In this context, the dependence of fourth rank order parameters on second rank order parameters is handled by being a measure of fractality of space. It is observed that the variation of second-rank and fourth rank order parameters versus temperature are in accordance with some values of fractal dimensions. As a result, we can conclude that there is a close relationship between temperature and fractional derivative order parameters. 1. Andrade, R,F, S, Remarks on the behavior of the ising chain in the generalized statistics, Physica A: Statistical Mechanics and its Applications, 1994, 203, 486-494. 2. Ramshaw, J, D, Irreversibility and generalized entropies, Physics Letters A, 1993, 175 (3-4), 171. 3. Ertik, H, Demirhan, D, Şirin, H, Büyükkılıc, F, A fractional mathematical approach to the distribution functions of quantum gases: Cosmic microwave background radiation problem is revisited, Physica A: Statistical Mechanics and its Applications, 2009, 388 (21), 4573-4585. 4. Ertik, H, Demirhan, D, Şirin, H, Büyükkılıc, F, Time fractional development of quantum systems, Journal of Mathematical Physics, 2010, 51 (8), 082102. 5. Ubriano, M, R, Entropies based on fractional calculus, Physics Letters A, 2009, 373, 2516-2519. 6. Hamley, I, W, Garnett, S, Luckhurst, G, R, Roskilly, S, J, Sedon, J, M, Pedersen, S, Richardson, R, M, Orientational ordering in the nematic phase of a thermotropic liquid crystal: A small angle neutron scattering study, The Journal of Chemical Physics, 1996, 104, 10046. 7. Tarasov, V, E, Fractional hydrodynamic equations for fractal media, Annals of Physics, 2005, 318:286-307. 8. Tsallis, C, Mendes, R, S, Plastino, A, R, The role of contraints within generalized non extensive statistics, Physica A: Statistical Mechanics and its Applications, 1998, 261, 534-554. 9. Metzler, R, Kalfter, J, The random walk’s guide to anomalous diffusion: a fractional approach, Physics Reports, 2000, 339:1-77. 10. Biyajima, M, Mizoguchi, T, Suzuki, N, New blackbody radiation low based on fractional calculus and its application to nasa cobe data, Physica A, 2015, 440, 129-138. 11. Gabano, J, D, Poinot, T, Kanoun, H, LPV Continuous fractional modeling applied to ultracapacitor impedance identification, Control Engineering Practice, 2015, 45, 86-97. 12. 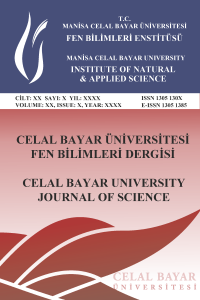 Sun, H, Zhang, Y, Baleanu, D, Chen, W, Chen, Y, A new collection of real world applications of fractional calculus işn science and engineering, Commun Nonliear Sci Numer Simulat, 2018, 213-231. 13. Hilfer, R, Applications of fractional calculus in physics, World Scientific, 2000, 463p. 14. Oldham, K, B, Spainer, J, The fractional calculus, Academic Press, San Diego, 1974, pp 234. 15. Podlubny, I, Fractional differential equations, Academic Press: San Diego, 1999, pp 340. 16. Saupe, A, Recent results in the field of liquid crystals, Angew. Chem. International Edittion, England, 1968, vol. 7, pp 97-112. 17. Maier, W, Saupe, A, Naturforsch, Z, A simple molecular statistical theory of the nematic crystalline-liquid phase II, 1960, 15a, pp 287.